Looking closer at the photo, I couldn’t tell if the expression of the woman dressed in white in the out-of-focus selfie was sad or ironic, or just indecipherable. Sue had been a medical transcriptionist for 32 years at a clinic in Menomonee Falls. But at the time she sent me her photo, Sue’s workplace had become a room in her home. When the clinic forced her to telecommute, she lost an office that she described as full of the chitchat of co-workers, a place where she fondly recalls “getting a medical education free of charge.” Instead, she spent her eight-hour workday alone. “I felt ugly because I worked in pajamas. … My work buddies were my pet birds,” she wrote. Two weeks after I met Sue, she wrote back to say she had been let go from the clinic. Her work had been taken over by the machine that some doctors already assumed she was when they stopped hearing her voice at the clinic, stopped seeing her face. With so much positive buzz about how the Internet and digital technology are changing the nature of work, I got to wondering how many Wisconsin work lives look like Sue’s. I asked Jon Shelton, a labor historian at the University of Wisconsin-Green Bay, what history can tell us about the ways in which we view work and workers in America—and how what we believe about work compares to the underlying realities. According to Shelton, another sea change in the labor landscape is how, in just the past couple of decades, many employers are finding new ways to shift their costs onto their employees. Shelton’s point reminded me of Sue’s description of how her former office in the clinic is now being used for patient visits. It had not occurred to me that Sue was being made to bear the cost of providing her own workspace. Sue is not alone in her predicament. Shelton notes that many employers are hiring workers as “independent contractors” instead of as traditional employees as a way to lower labor costs and save money on benefits. The number of workers now classified as independent contractors has skyrocketed in the past few years, and Shelton predicts that trend will continue. While some argue that independent contractor status offers employees more flexibility with working hours, this comes at a cost for contractors at companies like Uber, whose model requires that drivers pay for their own cars, maintenance and insurance, and even fuel. “Uber has been very controversial, because some argue that it is a positive workaround to traditional taxi services,” Shelton says. But “the reality, in my view, is that Uber’s main source of innovation is dramatically lowering labor costs by shifting its costs onto its ‘contractors.’” Like many other independent contractors, Uber drivers also have no workers’ compensation on which to rely if hurt on the job, or unemployment benefits if laid off. Since the dawn of the Industrial Revolution, anxiety over technological innovation and worker obsolescence has been part of the conversation surrounding working life. However, workers in Wisconsin enjoy certain opportunities and face particular challenges. It seems that the national shift from a manufacturing- to service-based economy has yet to curtail this fading bright spot in an otherwise dim employment outlook. In recent years, overall job growth in Wisconsin has lagged behind the national average, and 27% of the state’s workers earn poverty-level wages (around $11.00 per hour). Shelton attributes the decline of good-paying jobs in the U.S. and in Wisconsin to policy-level erosion of worker protections such as collective bargaining. He expects the situation to get worse in Wisconsin as a consequence of the “right to work” legislation that became law last year. Explanations rooted in statistics and policy paint a backdrop for why work is changing. But stories like Sue’s connect us to the experience of work today. Yet we rarely take the time to have a conversation about our assumptions about—and attitudes toward—an endeavor that takes up over half our waking hours. “It seems that too many in our state know too little about the nitty gritty tasks and challenges bound up with the labor of their fellow citizens. We need to know more about our respective working lives. We need to talk about why some jobs are publicly valued while others are derided or disregarded,” says Jim Leary, a folklorist who studies the cultures of working people in Wisconsin. The work we do—both paid and unpaid, both public and private sector—defines us, and, all too often, divides us. In an effort to create some deeper conversation around work in Wisconsin, Leary, Shelton, and other scholars, journalists, laborers, and business owners will be leading public discussions through ShopTalk, a newly launched program of the Wisconsin Humanities Council that explores the lives of Wisconsin workers. By creating spaces to explore what work is really like, ShopTalk hopes to break down divisions and improve the quality of public dialogue, with implications for policy and the workplace alike. Jessie Garcia, who works as a television sportscaster, will share with ShopTalk participants her struggles in balancing work and mothering. And it is in the spirit of open conversation that ShopTalk is reaching out to men and women across the state to host their own discussion on the changing nature of work. As local organizations host ShopTalk events—anyone can host one—with Garcia and other presenters (see sidebar for complete list), people from all walks of life will have a chance to share their stories and ideas. To establish a focus on the human experience of work, presenters will include personal stories from their lives in their talks, and invite their audiences to share stories from their working lives in response, so as to build discussion around concrete experiences. “I have made some decisions in my life that surprised people and perhaps weren’t the ‘expected’ path and I have learned a great deal from my experiences. I want to share my story and hear other peoples’. I envision lively, open conversations that go deep and leave us all feeling more connected,” says Garcia. Making connections is central to any good storytelling. Former farmworker and labor union organizer Jesus Salas knows the power of rendering portraits of migrant workers’ lives through stories. Salas, a child worker when his family began travelling seasonally between Texas and Wisconsin in the 1940s, went on to found and lead Obreros Unidos, an independent agricultural labor union. For the ShopTalk conversations he leads, Salas has stories that only he can tell, such as how an organized march from Wautoma in the Central Sands vegetable-growing region to Madison changed Wisconsin history. “Nowadays I see more divided opinions than commonly-held understandings about who is or isn’t a Wisconsinite, and about what does or doesn’t count as worthwhile work,” says Leary. The Wisconsin Humanities Council created ShopTalk to draw people out of their separate lives, to come together and examine their divisions and work toward a better understanding of one another. 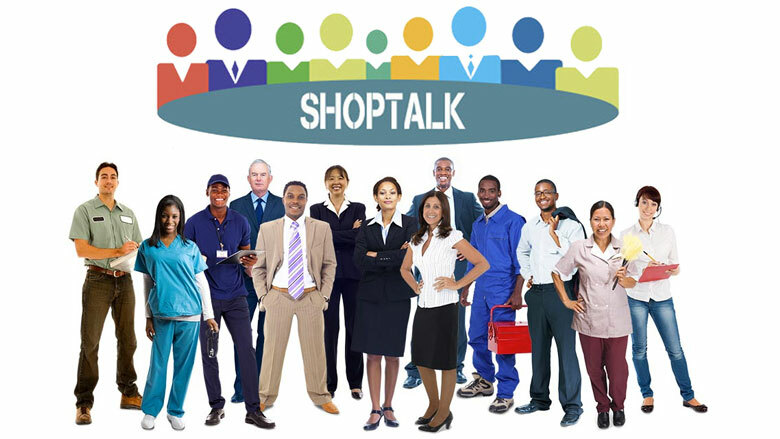 Wisconsin groups are eligible to host two free ShopTalk events per calendar year. Choose a theme that fits the interests of your potential audience. ShopTalk’s 40+ topics have been sorted into three themes to make choosing easier. Working People: Life Paths, Work in Context: The Big Picture, and Pulitzer Winners: Reporting for a Living. The ShopTalk website makes it easy to directly contact a ShopTalk presenter via e-mail to plan an event. See the list of presenters below. Once you have agreed on an event date, time, and format with the ShopTalk presenter, fill out the online application form. Applications must be received by the Wisconsin Humanities Council at least six weeks in advance of your event. Your application will be reviewed within two weeks. Visit wisconsinhumanities.org/shoptalk for more information or to choose your talk. Dena Wortzel worked with the Wisconsin Humanities Council since 1994 before becoming director in 2008. Prior to 1994, she supported community development efforts in developing nations and educated Americans about issues of world hunger and poverty.